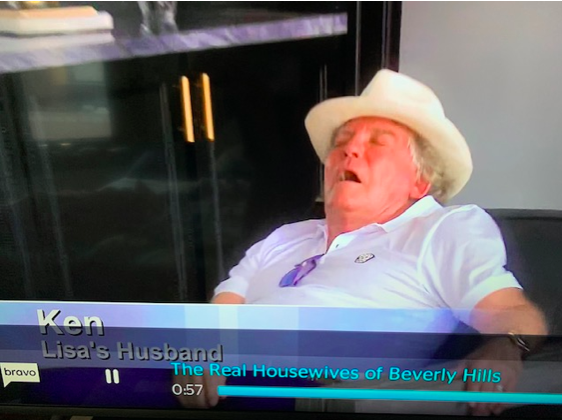 This season of The Real Housewives of Beverly Hills has been slightly less of a snoozefest more dramatic than seasons past. For nine episodes (and counting) viewers have been following the saga of an adopted dog named Lucy Lucy Apple Juice (I wish I were kidding. Also, why is it not Juicy?) who mysteriously ended up at a shelter. Those who don’t watch the show (how dare you) may have seen references on social media to #puppygate and, most recently, the Goodbye Kyle Challenge and wondered WTF is going on. Because I’m such a good friend, I’m here to break down the dog drama for you and explain why I’m on Team LVP and you should be too. Dorit explains at the beginning of the season that she adopted a dog from Vanderpump Dogs, an organization founded by, you guessed it, Lisa Vanderpump, aka LVP. Because the dog bit Dorit’s husband and children, she decided to give the dog to a “biz associate” who “fell in love with” Lucy according to a tweet from Dorit on February 27th. Seems reasonable enough. However, for reasons that are still unclear, Lucy was taken to a shelter and the shelter contacted LVP after scanning Lucy’s microchip. Teddi claims that she was involved in a plot, orchestrated by LVP and her employees, to expose this on camera and make Dorit look bad, an accusation LVP vehemently denies. Dorit and LVP, who have been friends for years through their husbands, seemed to patch things up at the beginning of this season. This all changes when Dorit discovers an unflattering article about her and the Lucy situation published on Radar Online. Dorit and the rest of the cast believe that LVP was behind the article and the entire #puppygate storyline. When Kyle goes to LVP’s house to let her know this, things quickly get heated and Kyle is summarily kicked out of LVP’s house. We hear Ken, LVP’s husband, chillingly bellow “GOODBYYYYE KYYYYLE!” off-camera, launching a viral challenge on social media that is currently curing my rosacea. Even Kris Jenner is getting in on the fun. Do I need a hobby? Why yes, yes I do. This is far from the first time that LVP has been accused of manipulating people behind the scenes. As early as season 2, Adrienne Maloof accused LVP of selling stories to Radar Online. Camille has also alleged that her explosive revelation about Taylor Armstrong’s abusive marriage that same season were encouraged by LVP. Brandi Glanville has maintained that LVP manipulated her throughout her stint on the show, instructing Brandi to reveal that Adrienne’s children were carried by a surrogate in season 3, and in season 4 coaxing Brandi to bring magazines alleging trouble in Kyle’s marriage on a cast trip to provoke Kyle. Lisa Rinna has said that it was LVP who was responsible for the entire controversy in season 6 centering on whether Yolanda Hadid really did have Lyme Disease by having Rinna suggest that Yolanda was actually suffering from Munchausen Syndrome instead. LVP has consistently denied any involvement in these controversies, but the sheer number of these instances and similar fact patterns are, at best, highly suspicious if not totally damning. Even Kyle, her frenemy good friend, has compared being friends with LVP to “playing chess with Bobby Fischer.” Although the owner of Radar Online has said LVP is not a source for the website, it’s hard to believe LVP had nothing to do with the story getting out there. In appearances leading up to this season’s premiere, it’s been clear to viewers that there is a major rift between LVP and the rest of the cast and that the narrative was going to focus on LVP’s alleged misdeeds and her long-awaited comeuppance. But even if LVP is guilty of everything she has been accused of, I find myself still taking her side, something I’m not sure the other ladies or Bravo counted on when crafting the narrative arc this season. We learn early on in the season that LVP’s brother committed suicide just months before shooting began. While grief is not a valid excuse for bad behavior (a concept that Lala on Vanderpump Rules continually fails to grasp this season), it does give LVP more humanity than we’ve seen from her in previous seasons where she has maintained the proverbial stiff upper lip. For the rest of the cast to choose this time in LVP’s life to gang up on her is especially gross. I may have been able to get on board with a takedown on another season, but with all she is going through now the pile-on is backfiring. It’s also hard to get behind Dorit when she is far from a reliable source. We can’t forget that this isn’t the first dog she adopted from Vanderpump Dogs. I can believe that a first dog didn’t work for her family, but to give up a second dog for the same reason looks a bit more suspicious. Even if we believe her, she was more than familiar with the protocol the second time around (or should have been). I know she didn’t want to pay the $5,000 penalty because she doesn’t have it didn’t read the contract carefully (if at all), but giving the dog to a business associate she can’t completely vouch for, rather than return the dog to the safe place it came from run by a vocal advocate for animal welfare, is convoluted and shady. In other words, totally on brand for her. It’s unclear whether or not LVP will be back for season 10, though her rift with the other ladies makes it unlikely. But what is this show without her? Almost all of the memorable moments on The Real Housewives of Beverly Hills are the result of storylines that she (allegedly) orchestrated. Without LVP, what would we be left with—Kyle gallivanting around town with the rest of the gang in an unfortunate hat and/or muumuu and laughing at her own corny jokes? Dorit dressing like an extra on Star Trek and calling it fashion? While it was a slight improvement to see Teddi get in the mix more this season, she remains boring and unlikeable, especially with her hypocritical inability to hold herself “accountable” until it was clear she was going to be set up this season. And no matter how hard she tries, being on time and working out do not a personality make. Erika hasn’t given us much since at least two seasons ago, and Rinna is at her best when she has a worthy opponent. Denise is a breath of fresh air, but still too new and likely can’t carry a show if her ex-husband needs to be mentioned every episode. Betchina George’s real name is Amanda. When she isn’t busy judging, she can be found watching Bravo, drinking chardonnay and talking about her favorite blind items.